NPR recently featured an interview with Greg O’Brien, a journalist with early-onset Alzheimer’s. I found O’Brien’s personal take on Alzheimer’s quite profound. I like how visually he described the disease, saying, it is like “a plug in a loose socket” that you keep trying to plug in but eventually it stops working and the light goes out. The one point that really struck home with me was when he describes how having Alzheimer’s disease forces you to find your own identity each and every day. He says the pieces of his self-identity, the who, what, when, where and how are like cards carefully arranged in a file cabinet. I thought that was a very simple yet powerful way to sum up this disease. 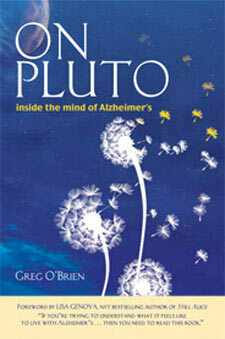 O’Brien has written a memoir, “On Pluto: Inside the Mind of Alzheimer’s” and I plan on reading it soon. If you have read the book, I would love to hear your thoughts. That really is a good way to describe it for people to understand it. Thanks for sharing this.